The results are shown as a top down view, and a cross-section of each scan line. 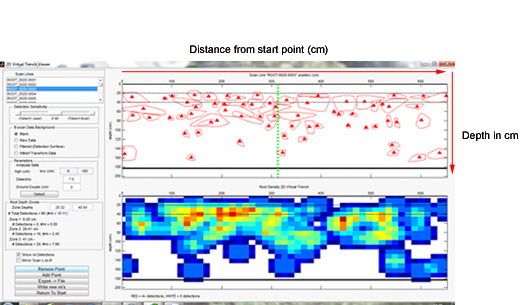 The location of the scan lines is based on the plotting from the survey, and the length of the line on the plan by the exact length of the scan itself. Scan lines are shown in red with the direction of the scan indicated by red arrows. Each scan line has a number. Please note that the image shown above is of an open-grown tree.Â If there are obstructions preventing a series of concentric circular scan lines, the image above will not be produced, however the data will still be relevant. The image on the left is a cross-section of a scan line on one of the veteran oaks at Burghley. The red triangles represent roots with a diameter greater than 20mm. The green line is a surveying marker, and the pixelated colours are an indication of root density. Blue is low, Green is medium, and Red is high. 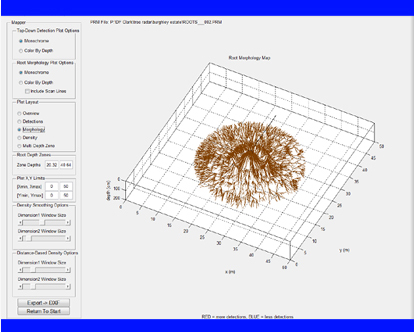 The Root morphology as represented by a 3D map, rotating on the GUI.